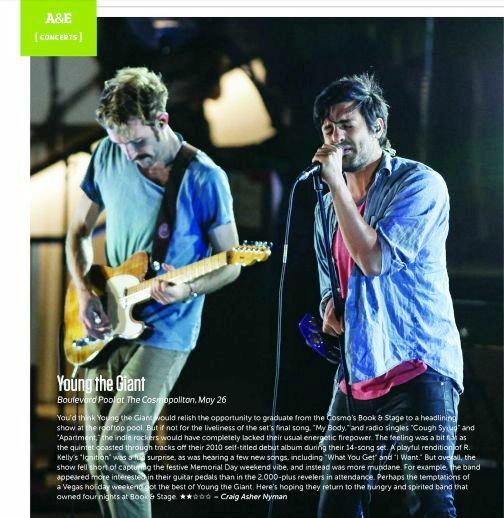 My review of Young The Giant in Vegas SEVEN (5 31 12 Issue) | Do You Hear The Music? No secret if you read this blog you know how big a fan of Young The Giant I am so naturally when the opportunity came to review their most recent show for Vegas SEVEN, I jumped on it. My review appears in the May 31 issue and since I can’t be biased in my reviews, there in print lies my true thoughts on the show. Having seen these guys a handful of times, this was by far the most disappointing show to date and really a shame since I’ve seen them absolutely crush it the other times. Hoping when I see them again, next week, that energy and enthusiasm is back!